A bar necklace usually refers to a simple necklace with a horizontal bar, attached on either side with a matching chain, either silver or gold. A custom bar necklace can also refer to a vertical bar pendant necklace, which have become popular more recently. In general, the bar necklace is simple and understated but is definitely chic enough to stand out against all the other wild styles of necklaces. The custom bar necklace can come in many styles (typically horizontal or vertical), many materials (usually gold, rose gold or silver) and can be as extravagant or as simple as you like. Hollywood elites, like Emma Watson and Jennifer Lawrence have been seen wearing this simple, custom bar necklace. Bar necklaces are a hot trend mainly because they are super minimalist, and can therefore be paired with all different kinds of necklaces and jewelry. Emulate hollywood fashion with this classy necklace, or personalize your wardrobe with a custom bar necklace designed with you in mind. The year 2018 has brought about a lot of new jewelry trends, and the Spring 2019 runways are changing up the trends once more. Though trends come and go, there are classic, timeless pieces of jewelry that seem to outlive the fluctuations of fashion and jewelry trends. Rings, rings, and more rings! But what can we count on? Trends fade in and out, some coming back no matter how much we wish they were dead -- ahem, crocs or high heels with socks! Other trends go out of fashion, though we secretly wish they didn’t! Track suits are comfy and fanny packs are super useful -- why can’t we bring those back?! Ah well. When it comes to jewelry, there are certain pieces of jewelry that every woman should own because they are never going out of style. Some jewelry is truly timeless -- their simplicity and classic beauty make them easy to pair with whatever trend has taken over in the modern age. Their simplistic style makes them versatile and easy to pair with all of your other different types of necklaces and crazy pieces of jewelry. They are easily personalizable, giving them sentimental value that will outlive all your other pieces of jewelry. The DIY scene has exploded in recent years. Millennials under the age of 35 have begun to dominate the 29 billion dollar crafting industry mainly because millennials tend to value active participation, experience-based learning, and individual customization. Basically, DIY means “do-it-yourself,” and it has two broad definitions: home improvement projects, and arts & crafts. You can also check out Amazon’s best sellers in jewelry metal stamping tools. Tape your stamping blank onto your metal bench block with the masking/painter’s/stamp straight tape. Place your tape so that it holds your blank bar in place and gives you a straight edge to stamp your message. You can place a piece of tape at the top of the blank as well so that there is just a sliver available to stamp your words. Pick out the metal punch stamps to create your own personalized message and place them in order. Make sure they are all turned the right way. Start with the middle character. Hold your stamp in the middle of your bar and, with your hammer, lightly tap the punch stamp. Follow this with a harder hit. The first light tap ensures you get a feel for where to hit, while the second harder hit allows you to leave a deeper impression of the stamp. Once you’ve hammered in your first character, stamp the letters one at a time on either side until your message is complete. Now that everything is hammered in, use your black marker to color over the message. Next, pour some rubbing alcohol over a cloth and wipe away the marker from the bar necklace. The marker should be cleaned from the surface of the bar pendant, but the letters will be darkened to make the message more legible. Decide on what chain length you want -- if you’re going for an 18-inch necklace, then 1.5 inches will be taken up by the stamped bar (if it is horizontal), and another half inch will be for the clasp (approximately). So, you’ll want to get a 16 inch chain, cut into 2 equal lengths of 8 inches. Connect each piece of chain to the bar using your small jump rings and your chain nose pliers. If you decided you don’t want to make your own bar necklace afterall, feel free to contact us and we can make it for you! Check out this book that gives easy, step-by-step instructions for DIY Metal Stamped Jewelry. Bar necklaces look great without anything on them and don’t require an engraving! A bar necklace can look classic if left plain, but you can also add a personal touch if you decide to engrave your horizontal bar necklace with something meaningful. It’s hard to know what to engrave on a bar necklace because you want to simultaneously develop your own unique sense of style, make a statement and stand out, and express timeless beauty. The delicate bar necklace is the perfect way to satisfy all these different expectations you have for your jewelry. Whether you want a simple and plain bar necklace, or you want to embellish it a little with a meaningful and personalized engraving, a personalized bar necklace is the way to go. Names allow us to identify what is meaningful to us. Names give us a handle -- something to hold onto. We name things just like we name people -- names give us a way to make sense of an alien world. Whatever name holds meaning to you -- your own, a friend’s, a loved one’s, a spouse’s, relatives’, family member’s, your dog’s or cat’s, your company’s, or your car’s -- chances are, there are at least a couple names that come to mind that hold value and importance in your life. Monogrammed necklaces rose in popularity due to celebrity style, and they’re a great way to keep a loved one close to you while still slightly obscuring their identity. Consider engraving yours, your partner’s or your cat’s! There are a lot of meaningful locations to us. For instance, where you were born, where you call home, where you married your spouse, where your children were born, where you spread the ashes of a loved one, or where you hope to move to one day. Is there a song that is super meaningful to you? Maybe your favorite song, or the sound of a loved one’s voice saying “I love you,” or of your first dance with your husband/wife! The popularity of hashtags has ventured out of its social media world and into the jewelry and fashion design world. Whether you’re a mom (#momlife), a runner (#runnergirl), a vegan (#vegan), or a boss (#girlboss), there’s a hashtag bar necklace out there for you. There’s a lot of really great inspirational & motivational quotes for you to choose from, but remember to keep it sweet and simple in order to fit it on the engraved horizontal bar necklace. Personalizing your bar necklace with your own handwriting takes the whole “personalization” trend to the next level. By incorporating your own handwriting, it’s like you’re sending a unique message meant only for the wearer to love and cherish every single day. Whether you want to give yourself a little reminder to be kind, or you’re looking for someone else, these handwritten custom bar necklaces make it truly one-of-a-kind. Other people might be inspired by the same quote or identify with the same hashtag, but who else has your handwriting? Is there a beloved family pet in your home? Perhaps a family pet recently passed away? A delicate bar necklace engraved with your old dog’s name and face will remind you of the love and bond you shared. We all have meaningful dates in our lives, from birthdays to wedding dates, from the day we moved into our forever home to the day of our first meaningful job. We remember our lives by certain significant moments -- everything else is like padding that falls in between. Keep those moments close to your heart with a personalized vertical engraved bar necklace. Different songs touch us in different ways and music, in some way, is significant to each and every one of us. Chances are, you can probably think of a song that weighs heavy in your heart right now. Consider engraving a portion of the lyrics on a custom bar necklace, or even getting a soundwave of the song engraved on a horizontal bar necklace! Literary quotes might be too long to engrave the whole thing on a bar necklace. However, don’t let that discourage you! There are other ways for you to keep with you those meaningful literary quotes. Consider shortening the phrase and having it trail off with an ellipsis. Or, you could engrave the name of a book or author who made a lasting impression on you! Bible verses are commonly engraved on the bar necklace since different verses can be meaningful to different people and they are easy to engrave if you just engrave the book, chapter and verse. For instance, you can keep with you this whole bible verse -- “For I know the plans I have for you,” declares the Lord, “plans to prosper you and not to harm you, plans to give you hope and a future” -- while only engraving Jeremiah 29:11. Anniversary dates, wedding dates, birthdays, or honeymoon dates! A roman numeral bar necklace doesn’t have to be confined to dates, however -- consider certain numbers that hold meaning to you, like the number of children you have, your lucky number, or the number of your favorite player on a sports team! What is your favorite city? Did you move far from home and want to find a way to keep a little bit of home with you every day? With a personalized bar necklace of your home city’s skyline hanging close to your heart, this style of necklace is a great way to remind yourself that your current location is only temporary, and that home is where the heart is. Are you a nature lover? The moon phase, a cut-out of the mountains, or mama duck with her ducklings would all look great on a custom bar necklace! Keep nature close to you even in the hustle and bustle of a jam-packed city environment. 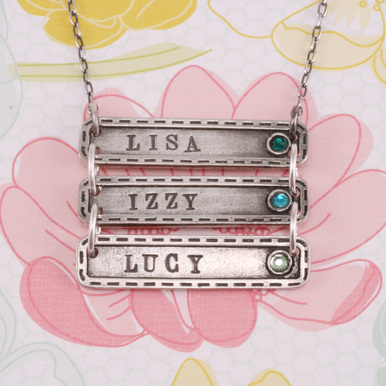 We hope you got some great ideas for your next personalized bar necklace! Whether you are excited to make your own in true DIY fashion, or you’d rather leave that job up to professional jewelry makers, we hope you enjoyed the read! Feel free to comment your thoughts, likes and dislikes in the comments section below!